We are providing Oil Press Machine EPS CG 150 to our clients. We EPS Exim from 2017 serving our customers by Manufacturing, Wholesaling, Exporting, Importing, and Trading a high-quality Kitchen Oil Press, Mini Oil Expeller and many more. All offered products are manufactured using high-grade materials and latest technology. This product range is highly required for their features like super performance, long service life, high efficiency, sturdy design and sturdy construction results reduction in noise and longevity. 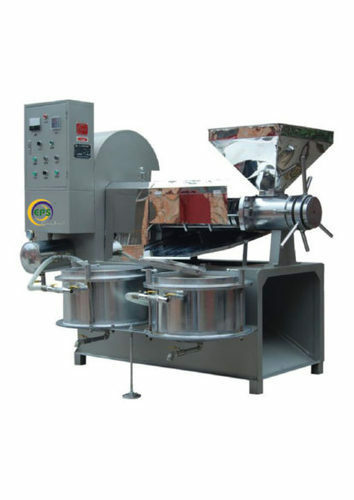 This offered range finds its applicability in food processing industries. The asset of our organization is young engineers who have sound practical experience. From the starting, we have built the strong infrastructure. Our infrastructural facility is segregated into various sections for the hassle-free production process. Further, we organize training sessions for our team members to handle new technology that is used in production processes. The skilled quality controllers endeavor towards maintaining the quality of our range and check the production process at every stage. The team of marketing representatives is responsible for promoting our line of range.